Do you remember in the Max Power era when the perceived quality of your in-car tech was calculated by whether or not you could answer “yes” to the question: is there more room for speakers and sub-woofers in your car than passengers? Well, thankfully, those days are gone and we're looking at a much more intuitive and integrated in-car future than we ever imagined during those laddish nights of car-park cruise culture. What we, as drivers, need from our vehicle's in-car tech is moving on significantly as connected-everything gathers momentum. Google's self-driver already has a removable steering wheel, so it's easy to imagine that even that mainstay instrument could eventually retract away into the dash when it's not needed, as your autonomous car zips you around. While your car is talking with a city's infrastructure to work out your best route to the office, you'll need to find other ways to entertain yourself on the move. Think about it, if your car is doing things such as communicating with other vehicles to work in conjunction with them, caravanning like a road train coupled together via a data connection in order to travel around as a pack, what are you as the 'driver' going to do? Look at Mercedes' much-lauded concept the F 015 Luxury in Motion as an example of where we might be by 2030. Mercedes imagined the world by that time to have accepted autonomous driving as normal. If situations arise when it isn't fun to drive yourself, like traffic jams, the car will just take over and do it for you. It also supposed that, inversely proportional with the inevitable ever- growing urbanisation, the shrinking of personal space and lack of one's own time will occur – which broadly means that as the real world's urban areas get more congested, you'll have less and less opportunity to find room for yourself. With that in mind, the F 015's cabin maximises the time you get to spend in your own environment. So your Merc drives itself to pick you up, the doors open and you glide inside. There, you can sit back and consume your media via the six eye-tracking-controlled screens, or just tune out for the duration of your journey. Your car, don't forget, needs nothing more from you than an input to state where you're going – it'll sort the rest.So there you are, in your little protective bubble, being chauffeur- driven by your car. This is your future. Do you like it? This might all sound a bit too sci-fi, but it will be here sooner than you think. The big steps that we're about to see taken by car manufacturers are already well underway in R&D labs the world over. Take augmented reality, for example. Most of us think about AR going only as far as an app that shows the way to the nearest restaurant or bar. But in the car, it'll do so much more. It's not that much of a leap to finding you with windscreens that will no longer be merely your windows to the outside world, but rather your guide. The windscreen will become a full-screen Heads-Up Display (HUD), feeding you info that you need to see, right where you want it the most: slap-bang in front of you. Your GPS will no longer be a small screen suckered to the glass or popped into the dash; instead, it'll utilise the whole expanse of your windscreen, showing you useful information like direction arrows or warning signs as if they were painted on the actual road in front of you. The centre cluster around your steering wheel will no longer be the prime area for information relay; instead, all of the alerts and updates will be displayed across your windscreen. Manufacturers' prime concern, from a usability standpoint, is to make you a safer driver, so keeping your eyes looking up and forward for as much of the time that you're behind the wheel as possible is a huge goal for all of the technology that's being developed. To this end, voice commands will get even more usable, as the best way for you to get what you want in your cabin is to say it out loud, rather than taking your eyes from the road to search for an environment setting or a headlight switch-gear. Already, this future is beginning to show in the real world. 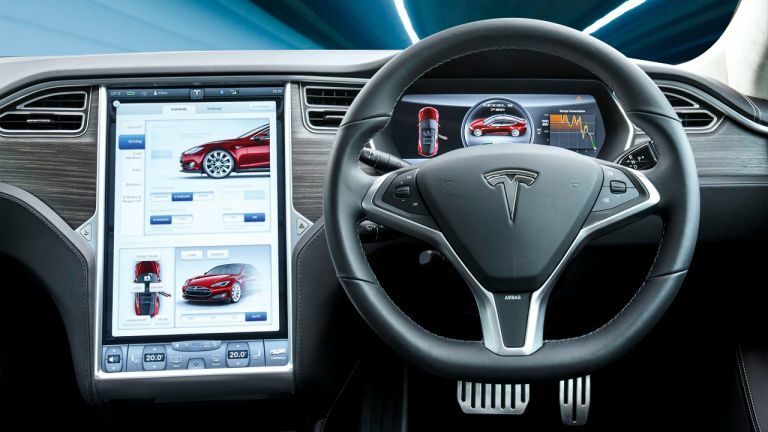 Tesla has a huge 17-inch touchscreen in its Model S, tilted towards the driver for rich content and mobile connectivity. And Audi is about to introduce the Virtual Cockpit with its 2015 TT, a 12.3-inch screen that sits behind the steering wheel in place of traditional dials, giving drivers the option to choose between an infotainment setting that brings functions such as the navigation map to the fore, or a more normal dial set-up (the TTS model has a virtual rev counter right in the middle). This tech was still a concept just a few years ago – when Porsche showed its 2012 Sport Turismo vision of the future, there sat a similar TFT screen, only that one also had a pair of screens to feed in the images relayed from exterior mirror cameras. It's rare for Porsche to do a concept but when it does, you can be pretty sure it's confident that what you're shown will become reality, so keep an eye out for those cameras. The cabin layout that you're so used to is already changing at a faster pace than it ever has before. Connectivity is the biggest thing happening in-car right now – your apps already talkto your car in more ways than ever. This is a huge melting pot where auto makers and tech companies are coming together, and one for which the auto side doesn't need to do too much development of its own – your phone does all the heavy lifting, your car just needs to facilitate it. To exemplify just how Really Big and Important this area of business is for the car industry, think about what it means that the President of the Fiat Chrysler group, Sergio Marchionne, recently spent a week in Silicon Valley taking not only a ride in Google's autonomous car, but also the opportunity to meet with Apple head honcho Tim Cook and Tesla founder Elon Musk. Cook is apparently, “interested in Apple's intervention in the car”, according to Marchionne. And of Musk, he said that he's “incredibly impressed with what that kid has done”. The fallout from these meetings obviously opens up many potential possibilities of cross-pollination for all parties, especially with Apple having already been so open about iOS auto integration withCarPlay. Fiat, don't forget, is the parent company of Ferrari, where you've seen a lot about CarPlay. And it's guaranteed that many similar meetings have happened with car manufactures and tech companies the world over. It's extremely exciting. But things get even more intriguing when you listen to the whispers that Apple is looking at a very real future of becoming an auto maker itself, with an electric car. If it moves into that area, you can imagine how wild the possibilities for in-car tech will be then. If Apple makes a car, will you get the ever-present start-up 'bong' chime when you turn the key? We kind of hope so. Mini showcased its Augmented Vision HUD goggles concept recently, and although they look ridiculous – think of the cover art for Will Smith superhero movie Hancock – the idea behind them is strong. As well as having an array of Heads-Up Display functionality, they've got the ability to see through parts of the vehicle so that blind spots are no longer a factor. For example, A-pillars and doors are effectively removed, giving the driver a much better idea of their surroundings. Other functions on offer include contact-analogue navigation and points of interest, enhancing reality by displaying the navigation arrows as if they were painted on the road in front of the car. Just like in a console game when you have the driver- assist turned on, your route would be lit up in front of you, so you could keep your head up and watch where you're going. This is an intriguing take on in-car VR and, regardless of the aesthetic horror of the hardware, it's all starting to make a lot of sense. Mini would just need to convince people that it's OK to look a bit of a plum while driving. What can we expect in ten years' time? Voice recognition started as a great way to reduce driver distraction, and we've researched that a lot. Situational awareness, which means having your eyes up, looking around, is most important for safety. Heads-Up Display can do that, because the display is up closer into the field of view, so you don't need to look down. How will the dashboard look to the driver? We want driver-oriented controls, but you'll probably still have an instrument cluster – it'll just have a different priority of data on it versus the HUD, so they will work together. What can you see going on in the cabin as far as 20 years in the future? We're doing research into that area right now. One of the things that we've really evolved on is to focus on experience and technology as an enabler for that. Ultimately, if we get to the highest level of autonomous driving, where the vehicle is trusted completely and the driver doesn't have to pay attention at all, you can present a lot of other information. The challenge is going to be that everyone wants more and to connect everything. But you've got to keep it simple. The interior of an autonomous vehicle has to be driven by the experiences consumers want to have.